Aggregate vinyl decking products by Tufdek™ are designed to simulate the look of professionally-poured aggregate concrete, offering sleek sophistication and performance without the maintenance and hassles of real aggregate. The slight warm tone of Designer Aggregate vinyl flooring for decks looks perfect against stucco or wood siding in warm or neutral tones, and contrasts nicely against lush green foliage. Designer Aggregate vinyl is a watertight deck product that is also a great choice for surrounding pools or other water features, without the “ouch” factor of real aggregate. This waterproof decking product won’t wear down, crack, peel, or need re-sealing and maintenance. Unlike real aggregate and other concrete surfaces, Designer Aggregate vinyl decking will really stand up over time. Tufdek™ uses our proprietary Aqueous based inks with a revolutionary Polycarbonate top finish on all Tufdek™ vinyl waterproof deck products to ensure our products can stand up to the rigours of high-traffic areas from people, pets and kids. If you want a waterproof vinyl deck that will stay cooler when exposed to the sun, Tufdek™ also offers Cool Step™ vinyl decking products that reflect rather than absorb solar heat plus harmful ultraviolet (UV) and infrared (IR) ray. Extensively and regularly tested to meet exacting requirements, Designer Aggregate vinyl decking is one of many Tufdek™ products that are manufactured for high standards of quality and durability. Whether installed on a small patio, large deck, or expansive poolside surrounding, Designer Aggregate vinyl decking is a great option to offer warmth and durability. With the sophisticated look of Designer Aggregate vinyl decking, your outdoor watertight deck will look great, last long, and require a minimum of cleaning and maintenance. 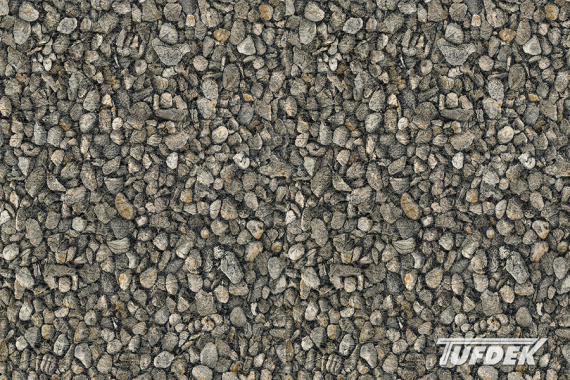 Call 1-877-860-9333 toll free or send us an email to order Tufdek Designer Aggregate vinyl decking. For more information about vinyl deck installation or any of our waterproof decking products, see our page on waterproof decking brochures and product profiles page or contact an authorized Tufdek™ dealer. Tufdek™ Designer Aggregate Vinyl Decking is only available through "Authorized Dealers"
Tufdek™ Designer Aggregate Vinyl Decking is assembled by one of North America’s leading PVC roof membrane manufacturers and quality audited by Intertek, an independent third party testing facility.